Tony writes: I’m an onion-soup orderer. It’s my default at the kinds of places you’ll find in airport hotels (nondescript, continental-ish restaurants and generic sports bars). It’s a safe play: this soup usually elicits a decent effort from a kitchen and the combination of a rich broth, browned strips of onion, and an s-load of melted cheese is hard to screw up. But as happy as I am to eat onion soup, I never really make it at home. Too much work to do it right: a homemade beef broth, slow-caramelized onions, and little crocks to gratine the cheese. But what if there were an easy way to make a decent homemade onion soup without it being a complete hack job? Deep intense flavors without too much work? I started wondering on a recent chilly Sunday afternoon and went to the kitchen to find out. -Quickening the caramelizing: In such a soup, the onions, themselves, would be the first (and most important) thing to simplify. The primary challenge to properly caramelized onions is patience (they’re the stove-top equivalent of toasting a marshmallow, with a whole lot of stirring taking the place of the stick). But if you transfer the browning of the onions to the oven, you could speed up the process and make the caramelizing hands-free. 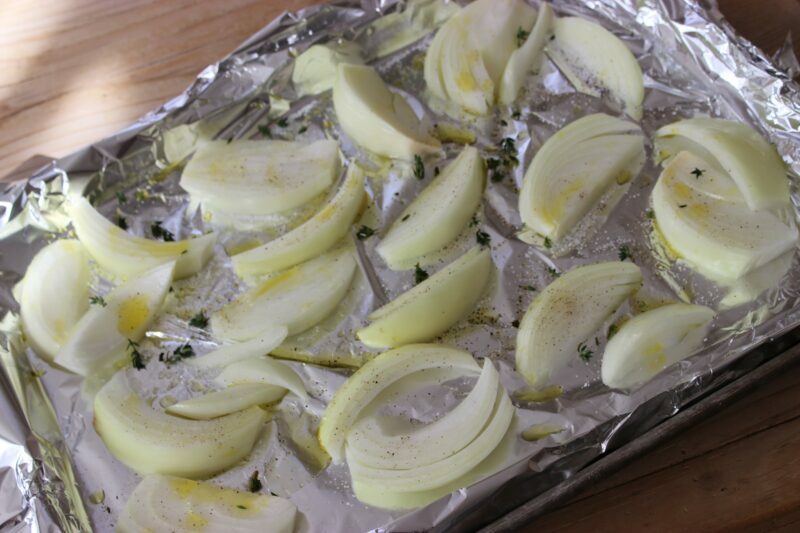 I cut the onion into thick wedges and roasted until they browned lightly and softened. Then, it was on to braising the golden strips in the soup. 1. Roast the onions: Heat the oven to 425F. Slice 1 large Spanish onion (about 1 lb.) into 3/4-inch wedges (cut the slices through the core so they hold together). Spread out on a rimmed baking sheet and sprinkle with 3/4 tsp. kosher salt, 1/2 tsp. black pepper, and 2 Tbs. olive oil. Roast the onions until they brown lightly and soften, 12 to 15 minutes. 2. Make the soup: Let the onions cool for 5 min, then transfer to a large cutting board and coarsely chop. Heat a large, heavy-based pot over medium-high heat. Add 2 tsp. olive oil and the onions, reduce the heat to medium, and cook, stirring, until they brown and soften, 5 to 8 min. Add 1/3 cup dry sherry (or marsala) and cook, stirring, until it almost completely cooks off, 1 to 2 min. Add 1 quart canned beef broth (preferably low-sodium) and bring to a boil. Reduce to a simmer, cover, and cook, stirring occasionally, until the onions become completely tender and the flavors of the broth intensify, about 20 min. 3. Meanwhile, make the croutons: Heat the oven to 425F. Cut 8 oz. baguette (about 1/2 baguette) into 1/2 inch cubes. Toss the bread cubes with 2 Tbs. olive oil, 2 tsp. chopped fresh thyme, and 1/2 tsp. kosher salt. Spread flat on a rimmed baking sheet and bake, tossing once or twice, until the croutons brown and crisp, about 10 min. Sprinkle the croutons with 6 oz. grated sharp cheddar (about 1 1/2 cups) and bake for another 1-2 min so the cheese melts. 4. 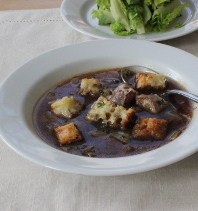 Assemble the soup and serve: Taste the soup for salt and pepper; add a splash of sherry vinegar if you like. Ladle into bowls, top with the croutons, and serve.